Well before the more pietistic style of Lutheran church music that Johann Sebastian Bach wrote at Leipzig in the second quarter of the eighteenth century came the Italian-influenced, Renaissance style of Michael Praetorius, the subject of Jeannette Sorrell’s well-crafted and expertly performed Christmas Vespers with Apollo’s Fire, which began a four-concert run at Trinity Cathedral on Friday evening before moving on to three different venues around town. You could hear the difference in approach in Philip Nicolai’s Wachet auf! Everyone knows the glorious, equal-note setting that ends Bach’s cantata of the same name. 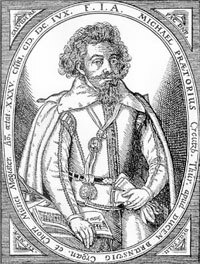 Not so familiar is the early form of the chorale tune with its dancelike, uneven rhythms, nor its delightful and ornate elaboration by Praetorius from his 1619 collection Polyhymnia caduceatrix. The latter, already bursting at its seams with exuberance, was decorated even further by Apollo’s Fire’s violinists and cornetto players (Olivier Brault, Johanna Novom, Kiri Tollaksen and Nathaniel Cox), who could barely force themselves to arrive at the final chord at several cadences. Divided equally into formats paralleling a Lutheran Advent Service and a Vespers Service for Christmas Day, the splendiferous two-hour program also featured brilliant chorale settings from Praetorius’s 1621 Musica Sionae and Puericinium and a dance suite from his 1612 Terpsichore, interwoven with chorales and liturgical pieces, performed by bands of strings and winds, a continuo ensemble of theorbos, guitar, organ and harpsichord, and Apollo’s Singers (23 adults) and Apollo’s Musettes (a dozen children’s and youth voices). There were too many special moments to count, but one of them involved the three featured soprano soloists, Nell Snaidas, Teresa Wakim and Amanda Powell, who stopped time in the first half with their astonishingly expressive performance of Ach, mein Herre from Polyhymnia and immediately returned to illuminate Wir glauben all an einem Gott with rays of vocal sunshine. Gloria sei Gott ended the first half with an ecstatic outburst from violinists Olivier Brault and Johanna Novom. Percussionist Matthew Bassett turned heads with his up-the-center-aisle introduction to Cesare Bendinelli’s Sonata per il giorno di Natale which opened the second half and featured flawless brass playing from trumpeters Josh Cohen and Joelle Monroe and the sackbut trio of Paul Ferguson, Peter Christiansen and Peter Collins. All forces contributed heartily to the multi-versed Magnificat (interrupted in time honored fashion — Bach continued the tradition — with a carol). Peter Bennett added a new sonority with his cheerful organ voluntary on Nun lob mein Seel from the other end of the nave, and the singers moved into the side aisles for a surround-sound version of In dulci jubilo to bring the evening to an overwhelmingly festive conclusion. From time to time during the evening, the voices of children and youth contributed importantly to the intergenerational feel of Praetorious’s music. In reviving the Praetorius Vespers program, Apollo’s Fire has provided a compelling alternative to the area’s holiday concert scene. If future performances are in their plans, it might be wise to shorten the programs even by ten minutes. It’s nice to have all those liturgical elements present, but after a while, just a little less begins to seem like just enough.